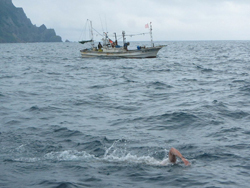 The Ocean’s Seven consists of seven long-distance open-water swims, and is considered the marathon swimming equivalent of the Seven Summits mountaineering challenge. It includes the North Channel, the Cook Strait, the Molokai Channel, the English Channel, the Catalina Channel, the Tsugaru Strait and the Strait of Gibraltar. The English Channel is known as the ‘Mount Everest’ of open water swimming by which all other swims are measured. The Channel’s chilly, turbulent waters are the ultimate proving ground, as they present many unique challenges to the pilot, crew and swimmer. My team and I left Dover Harbor early in the morning via the Pathfinder, piloted by Eric Hartley of the Channel Swimming Association. I walked into the Channel from Shakespeare Beach, below the White Cliffs of Dover at 4:04AM on July 19, 2010. An hour into the swim, I breathed to my left and could see the White Cliffs of Dover, and the coast of France off in the distance. I remember thinking, “How did I get here?” It was the most beautiful memory in all of my adventures. The hardest part in channel swimming is constantly being able to see your finish right in front of you, yet it can feel so far away. I finished on a rocky coastline, and clambered out of the water with the biggest smile on my face, because the iconic English Channel could not hold me down. I was a part of history. I was a Channel Swimmer. Southern California is another state of mind. The beaches, food, music and general laid back lifestyle surrounding the water are surreal. Catalina Island is off the coast of Los Angeles, and is separated from the mainland by a long stretch of cold, dark water. Jumping into a pitch black ocean in the middle of the night was unlike any experience I had ever been through. I remember the bio-luminescence in the water, and how it lit up in bright green bubbles which reflected off the moon. The floating kelp off the coastline was as thick as ropes and running into a patch when you cannot see anything is very interesting. The swim commenced around midnight, and I swam under the watchful eye of some of the greatest friends I could ask for; some were new, and others had been around for years. As the beautiful sun began to rise over the horizon, I remember the California coastline still in a low-hanging fog that only allowed me to view my landing site within a mile or two of the finish. I swam the final stretch accompanied by a pod of dolphins that seemed to guide me right into the coast. There could not be a more fitting finish than being treated to swimming with such beautiful creatures of the ocean. The Molokai Channel is known as the ‘Channel of Bones’ for a reason, as its treacherous waters have claimed the lives of many watermen through history. The incredible scenery surrounding Oahu and the mysterious island of Molokai is unlike anything I have been blessed to see. Jumping off a volcanic rock on La’au Point on the southwestern coast in the dark was something I will never forget. One mile off Molokai I fell victim to my first (of three) Portuguese Man of War jellyfish stings. It was directly on my face and neck; and felt like someone had pressed an iron on my skin. I was alerted at just past half-way that I was under the current record – I knew there was no turning back. As we came into Sandy’s Beach on the eastern coast of Oahu, Jeff and Vince jumped into the water for the final stretch, while Steve continued to kayak. Jeff guided me through the dangerous surf of ‘Breakneck Beach’. I rolled up on the coast, only to rise to my feet and run up into the sand. The mighty Molokai had a new record, and one tired swimmer! 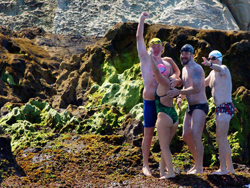 The Gibraltar swim was my most favorite of the seven, because not only was southern Spain simply incredible, but to have six friends along for the adventure was something I will never forget. There were a few times in my life when my breath left me; seeing the outline of the African continent was one of those times. I felt as though I could sit on the shoreline and view the panoramic view forever. Jen, Jamie, Oliver and I took off from the harbor in Tarifa as the sun was rising, and pushed off from Europe in the cool waters separating the continents. The sea was calm that day, and there was something about swimming in unison for 3 hours and 44 minutes that was quite peaceful. Our swimming and our friendships were inseparable across that Strait that day. The swim concluded as the sun was high in the sky, birds were flying and we climbed out on the closest piece of land we could hit on Moroccan soil. We hugged each other tight, and raised our hands to the sky in one final salute to a worthy advisory. Northern Japan was almost mythical, as the environment surrounding the Tsugaru Channel was a habitat that seemed unchanged for thousands of years. My brother, Matthew accompanied me for the first time, and needless to say he picked the right channel. We both loved the Japanese cuisine, culture and their kindness to foreign visitors. I started the swim by cutting my left shin, arm and hands off the start because I was stubborn and wanted to exit the water on a large boulder, versus just ‘touching the rock and go’ as instructed. As I stood there bleeding, I knew I only had one choice. The Sea of Japan was the toughest water I had yet to face, as the majority of the 15:55 journey went through 2-3 foot surface chop. This swim was the most difficult of the seven because I was expecting about an 8-hour swim, and it turned out to be double. As the final hours crept by, I was not making any progress, as I was only paralleling the shoreline. The water temperature dropped, and I had to sprint for two-hours at the end. I was able to break through the current and finish on Hokkaido. If you never quit, eventually you will finish! 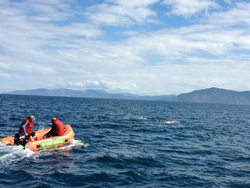 Craig Lenning and I tackled the Cook Strait only a few weeks after the media broke a story on a film director who was mauled by three Great White Sharks off the coast of New Zealand. It was a lot to take in when we were about to travel half-way around the world to swim the Strait, but we knew what had to be done. Under guidance from Philip Rush and my handler Shelley Taylor-Smith, we left the shores of the north island and headed south. The sun was shining, there was a slight chop in the water and the temperature was around 59F; not warm enough to spend anytime relaxing. The final few miles were challenging as the tides began to push up north up along the coast line. I will never forget the setting sun as it dipped down below the horizon because we knew we had to get moving quicker as we swam into the night. I could feel the tide pushing stronger as I was in a dead sprint the final few kilometers. I couldn’t see anything in front of me as we slammed into an ominous black rock wall to complete the swim! 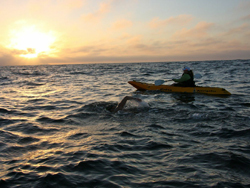 The North Channel is notoriously known throughout the marathon swimming community as the most difficult of the major ocean channels. It would be particularly challenging for me since I trained in the warm waters of Pittsburgh in the summer, yet somehow would need to adapt to the frigid North Sea. My entire family was on hand in Bangor, Northern Ireland as we waited for the call from pilot Brian Meharg aboard the Bangor Boat. 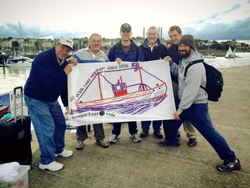 We only waited one day before leaving Bangor Harbor, and setting off from Donaghadee for Scotland. I wasn’t sure how my body would feel after several hours into the swim, but surprisingly the chill never seemed to really affect me. I had trained hard, and I knew that through acclimating throughout the previous two weeks in Ballyholme Bay, I gained the most valuable asset in all endurance sports – confidence. The water was calm, and the temperature was around 53-degrees as the start. My path was uncharacteristically straight across the channel, with only the fabled Lion’s Mane jellyfish to report. As we approached Scotland, I remember having the greatest feeling that I was about to complete a mission I had been working on for several years. I had put in the time and dedication, and in the end, I came out on top. There is nothing that takes the place of hard work, and when I touched Scotland, I knew exactly what that meant. 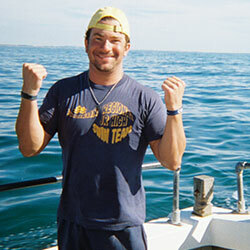 I had completed the ‘Oceans Seven’ on all first attempts, and became the first swimmer in the world to do so. What a wonderful completion to a journey around the world!